Joel Makin will face No 7 seed Paul Coll in Egypt. 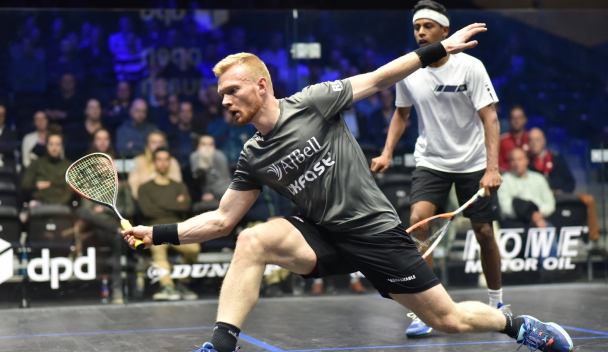 Joel Makin will face No 8 seed Marwan Elshorbagy for a place in the quarter-finals of the DPD Open in Eindhoven. The Haverfordwest-born player set-up the second round clash with the world No 11 with a comfortable first round victory in Holland. Makin saw off local wild card Roshan Bharos 11-3, 11-4, 11-5 in 42 minutes in the $106,000 tournament. “Roshan and I played a bit of juniors together,” said Makin. “I know Roshan because he trains in Bristol, which isn’t too far away from me. I know he’s working hard there and trying to improve his game. The 24-year-old Makin now based in Birmingham, will be looking to maintain the form this year that has seen him climb to career-highgh No 15 in the world rankings. Fellow Welsh ace Tesni Evans also faces an Egyptian opponent in the second round in Mariam Metwally. The 26-year-old is seeded eight for the $106,000 event and had a bye in the first round. Evans, who has regained her career high spot at nine in the world, has faced Metwally already this year beating her in the BlackBall Open in Egypt last month.